This article is about the geographic peninsula. For the borough, see Kenai Peninsula Borough, Alaska. The Kenai River & Mountains, August 2003. The Kenai Peninsula is a large peninsula jutting from the coast of Southcentral Alaska. The name Kenai (pronounced key-nye) is derived from the word "Kenaitze" or "Kenaitze Indian Tribe", the name of the Native Athabascan Alaskan tribe, the Kahtnuht’ana Dena’ina ("People along the Kahtnu (Kenai River)"), that historically inhabited the area. They called the Kenai Peninsula Yaghanen ("the good land"). The glacier-covered Kenai Mountains, rising 7,000 feet (2,100 m), run along the southeast spine of the peninsula along the coast of the Gulf of Alaska. Much of the range is within Kenai Fjords National Park. The northwest coast along the Cook Inlet is flatter and marshy, dotted with numerous small lakes. Several larger lakes extend through the interior of the peninsula, including Skilak Lake and Tustumena Lake. 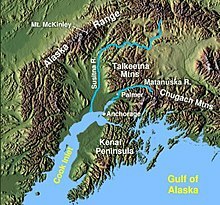 Rivers include the Kenai River, famous for its salmon population, as well as its tributary, the Russian River, the Kasilof River, and the Anchor River. Kachemak Bay, a small inlet off the larger Cook Inlet, extends into the peninsula's southwest end, much of which is part of Kachemak Bay State Park. The peninsula includes several of the most populous towns in south central Alaska, including Seward on the Gulf of Alaska Coast, Soldotna, Kenai, Sterling, and Cooper Landing along the Cook Inlet and Kenai River, and Homer, along Kachemak Bay, along with numerous smaller villages and settlements. Homer famously marks the terminus of the paved highway system of North America and is a popular destination for travelers who have driven to Alaska from the lower 48 states. Seward is the southern terminus of the Alaska Railroad. There are airports with regularly scheduled flights in Kenai and Homer as well as smaller general aviation airports in Soldotna and Seward. The Seward Highway connects Seward to Anchorage, and the Sterling Highway is the backbone of Kenai Peninsula connecting the larger towns to Anchorage. The peninsula has a coastal climate that is relatively mild, with abundant rainfall. It is one of the few areas in Alaska that allow for agriculture, with a growing season adequate for producing hay and several other crops. The peninsula also has natural gas, petroleum, and coal deposits, as well as abundant commercial and personal-use fisheries. Tourism is a major industry, along with outfitting and guiding services for hunters and fishers. The Kenai Peninsula is known as "Alaska's Playground". Wikimedia Commons has media related to Kenai Peninsula. This page was last edited on 26 April 2018, at 23:11 (UTC).